Paris Is Burning - EU Press Asks Whether Macron ‘Can’ Continue? The German tabloid Bild is the bestselling newspaper of the largest economy on the European continent, and thus one of the biggest newspapers being read daily. During the weekend, it normally runs front pages about anything the Germans are interested in, which means that today you would expect Merkel or the Bundesliga (German soccer league) to be the headline. 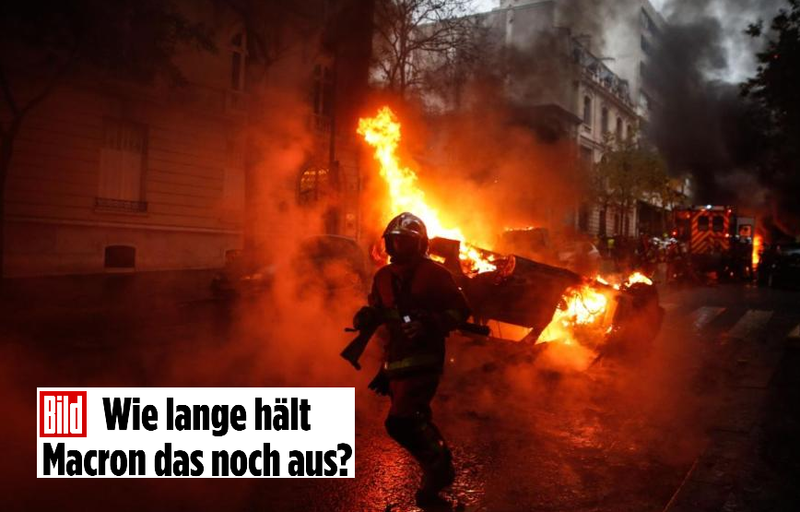 Unsurprisingly however, they went with the question that many European newspapers are asking today given the three straight Saturdays of rioting seen in Paris. Bild asked: How long can Macron still ‘survive’ politically? Over in Spain, El Pais had the same question. Three weeks ago, it looked like the ‘gilets jaunes’ (yellow vests) protest would be a 1-day thing. But after 280,000 people protested on the first Saturday, the anger against Mr Macron’s government spread into roadblocks and a social media outpouring about a president who’s not in touch with his own people. President Macron and his wife Brigitte decided to visit befriended heads of state in Germany and Belgium during the first week of the protests whilst his own people were waiting for him to say something. Only two weeks into the protest did the centrist President answer the call and gave a speech, saying he ‘understood’ the protesters but refused to give in to any of their demands. Ever since then, the protests have only hardened, and even spread to neighboring Belgium (and since this weekend also in Holland). If the first sign of ‘yellow vest’ protests were ever to be seen in Germany this week, you can be sure that the European heads of state would urge the French president to react differently. Over in France itself, Macron’s popularity has plummeted to 26%. Opinion polls for the 2019 European parliament elections predict that his rightwing rival, Ms Le Pen’s National Rally (or Rassemblement National, which used to be the Front National) will be level with Macron’s La République En Marche (if not far ahead as rightwing parties always tend to poll lower than they score in European elections). Related coverage: France – “State Of Emergency” Being Considered As Riots See Paris Burn Again (Video). According to political scientist Pascal Perrineau, he has lost three parts of his voter base: the left and the centre-left through his fiscal measures in favour of the rich; pensioners who have suffered cuts; and the middle classes and young voters. With these last ones, the bottom is falling out of Macronism: there is no longer any centrism as defined by Macron’s famous “at the same time” expression. The only winner of all these protests so far: Marine Le Pen, the presidential candidate who was accused of being ‘too populist’ when she ran against him. By now, many protesters say they’ve made a wrong choice last year. There are tweet videos of sniper shooting a man. Watch the tracers from the rifles, then a person hands up drops lifeless to the ground. People see it and rush to the downed person. Macron is murdering French people. Macron said "let them eat cake". We know how that ended the last time someone had this attitude towards the French people. Trump is giving us $2.00 a gallon gasoline now. The French can only dream of such things.